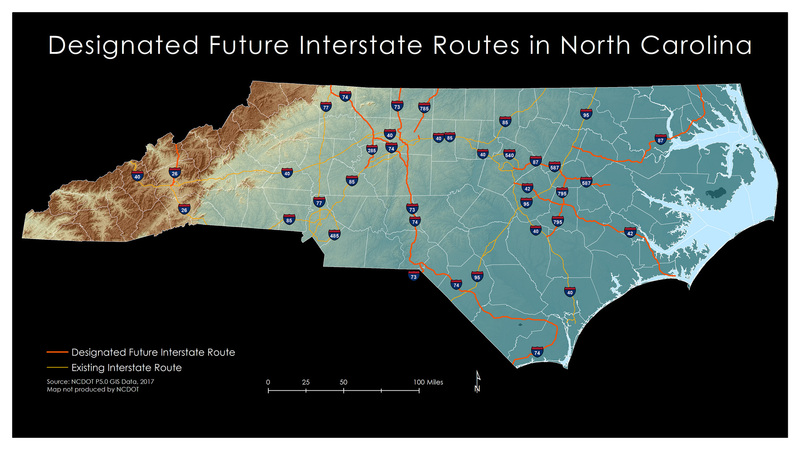 This proposed interstate, not officially approved, would run from the current I-85/US 70 interchange in Durham to I-40 once construction of the East End Connector is completed in 2020. Yes, this is not a North Carolina route, but one from my home state of Massachusetts. The proposed designation for current MA 3 between I-93 in Braintree and US 6 at the Sagamore Bridge in Bourne. If one can take an interstate spur from Providence, RI to Cape Cod why can't drivers from Boston to the Cape? Besides, doesn't America's Hometown (Plymouth) deserve its own interstate? Proposed-Have been officially endorsed by a government agency, but there are no current construction plans nor funds available for the route. Planned-Have been endorsed by a government agency and approved for construction with money available. Partially Complete-Part of the authorized route has been completed, some may be under construction. b. For the toll section, the NC 540 shield is accompanied on top by a yellow TOLL banner. 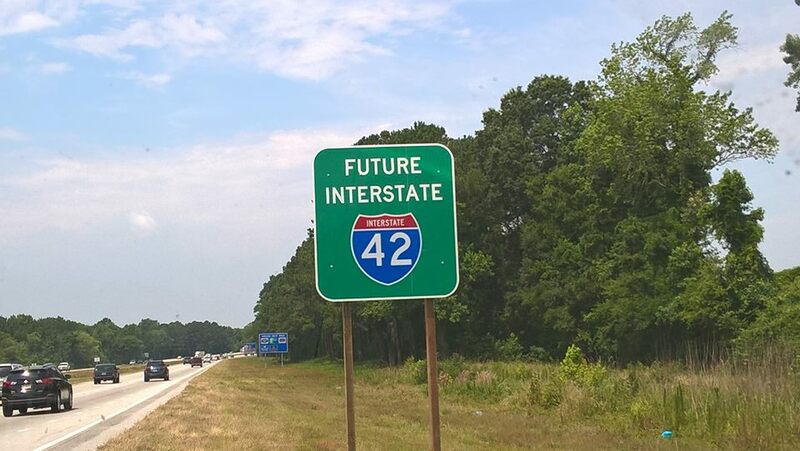 c. On 9/12/08 NCDOT decided to remove I-40 from the Urban Loop, and add US 421, signage changes which were mostly completed by September 2009.
f. In the new 5 year federal transportation bill passed by Congress in early December 2015, two new future interstate corridors where created, US 64 and US 17 from Raleigh to Norfolk, VA and US 70 from I-40 to Morehead City (and approval of an extension of I-795 from Goldsboro south to I-40). 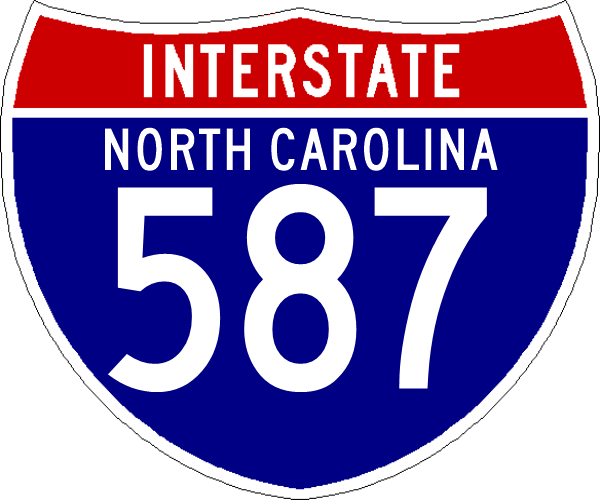 Based on AASHTO documents, NCDOT has applied for the I-36 number for the US 70 Corridor and I-89 for the Raleigh-Norfolk route for consideration at their May 26, 2016 Meeting (and placed a blank sign awaiting a shield on US 70, seen in this entry). AASHTO rejected these numbers and approved I-42 and I-87. 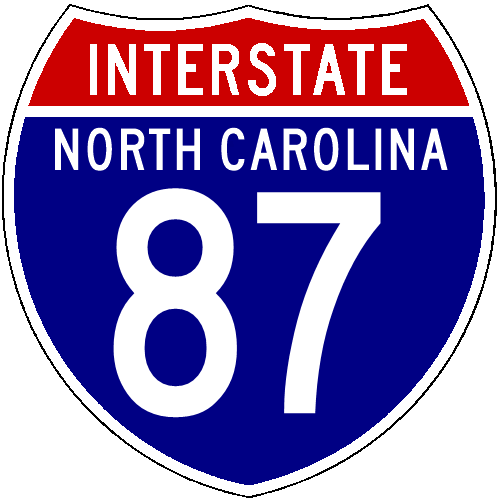 NCDOT started putting up Future I-42 and I-87 signs along the corridors in the fall of 2016. It is currently unknown when funding will be available to complete these corridors to interstate standards. ****NCDOT's Strategic Highway Corridors Triangle area map stated in 2004 that the route number for the Outer Loop would change from I-540 to I-640 when the eastern part of the loop reached Garner. However, new maps showing the proposed southern and eastern toll roads around the south of Raleigh continue the NC 540 designation around the southern and southeastern part of the loop (with I-540 continued to be signed on the free part) and NCDOT applied for a waiver from the need to change numbers which was approved with the application for I-495 by the FHWA in December 2013). h. NC Governor's Office. 2016. "Transportation Association Recommends Approval of Future Interstate Designation for US 264 to Greenville." Press Release, November 15. 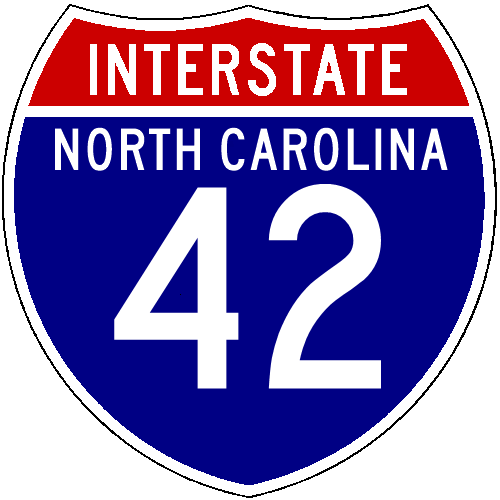 Downloaded from: https://governor.nc.gov/press-release/transportation-association-recommends-approval-future-interstate-designation-us-264, 11/15/16. i. Federal Highway Administration. 2016. Letter to Michael L. Holder, PE, NCDOT from Gregory G. Nadeau, Regional Administrator, FHWA. November 21. Downloaded from: http://butterfield.house.gov/sites/butterfield.house.gov/files/wysiwyg_uploaded/2016_11_21_12_26_17.pdf, 11/22/16. j. NCDOT. 2019. State Transportation Improvement Program, 2020-2029, Draft. January 10. Division 2, p. 11 of 43, p. 21 of 43. Site opened: April 26, 2004. Last Updated: April 18, 2019 (Added information to Index page). *Recently passed transportation legislation contains funds for I-795's eventual extension south to I-40. **Pages linked on this site are bolded, while pages on other sites are in italics. 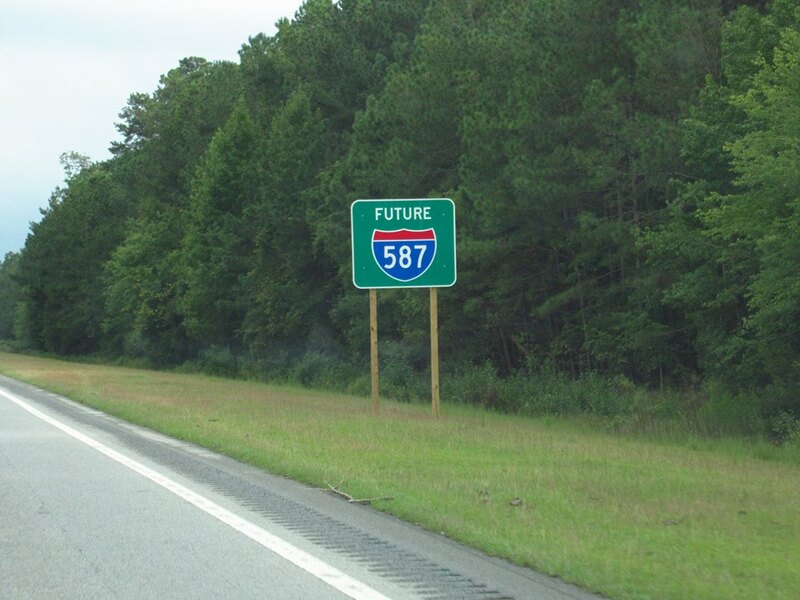 Background photo: Future I-295 Shield on westbound Fayetteville Outer Loop, taken 7/24/05 (taken down in 2015). Interstate shields images courtesy of David R. Kendrick's Shields Up!